Like many of you, we’ve been cooking as many meals as possible on our barbecue. 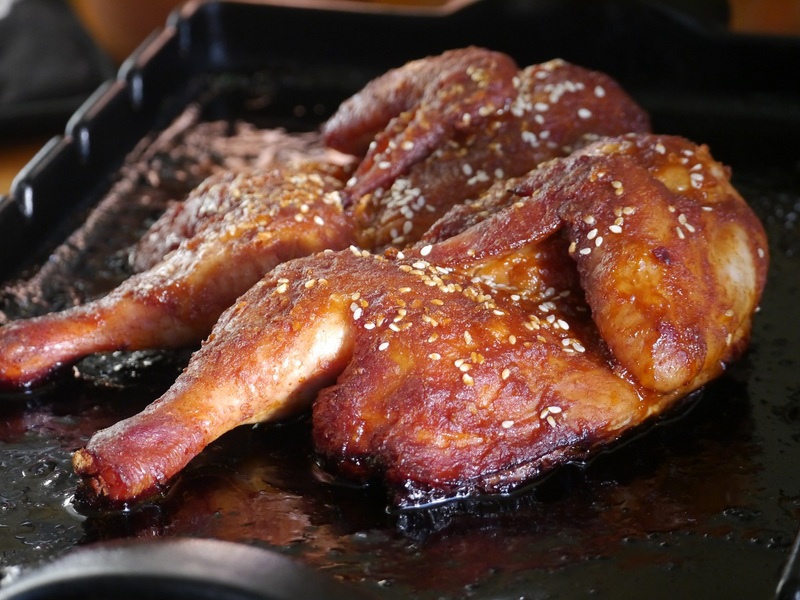 For me a whole butterflied chicken is always a favourite as I can marinate the chicken earlier in the day, then later, heat the barbecue, Mike puts the chicken in and after 45 minutes its done. Easy and the kitchen stays cool!! For the chicken marinade and the salad dressing I’ve used simple Asian ingredients readily bought at most supermarkets. Mix together all the marinade ingredients in a dish that is big enough to fit the chicken. Add the chicken making sure to coat it thoroughly. Cover and leave to marinate in the fridge preferably for a few hours. Take the chicken out of the fridge at least 30 minutes before you want to start cooking. Heat a lidded barbecue to a moderate heat. Place the chicken in a foil oven dish or on an Emile Henry grill stone, put the dish on the grill or hotplate and close the lid. Depending on the size of the chicken it should take about 45 minutes to cook. Halfway through cooking sprinkle with a few sesame seeds and baste with more of the marinade. At any stage the marinade in the dish may start to burn because of the honey in it. If so, add a little water to the dish for time to time. Once its ready, remove the chicken from the barbecue and let it rest for 5-10 minutes before serving. I’m hooked on using farro at the moment but any grain would be fine for this salad – eg pearl barley or a mix of brown and wild rices. Also change the vegetables around as you feel like it. Make sure you dress the farro with at least half of the dressing while it’s still warm so it absorbs the flavours of the dressing. Toss the squash pieces in a little olive oil, salt and pepper. Place on an oven tray in a moderate oven until golden brown and soft but not mushy. Toss the broccoli and cauliflower florets in a little oil and salt and pepper, place on an oven tray and roast till both are looking a little charred (not burnt) on the edges. 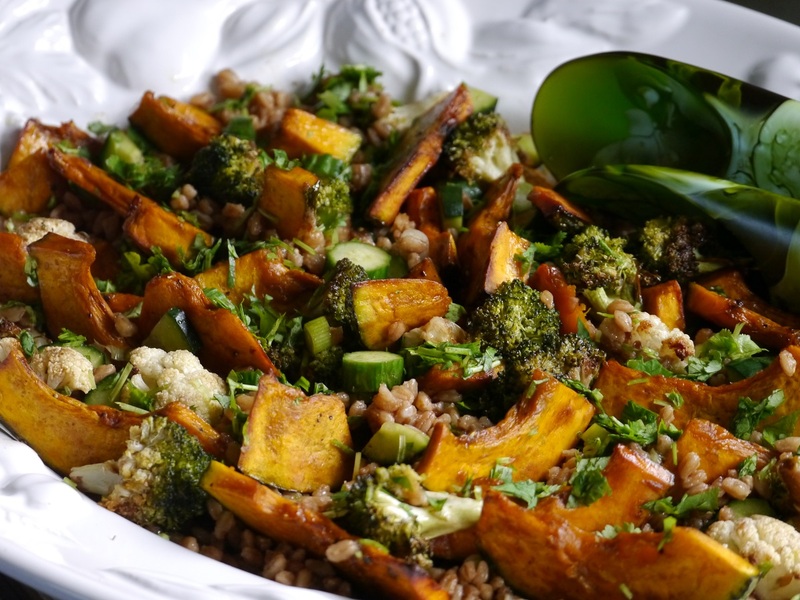 Using your hands or large spoon gently combine the all the vegetables with the farro. Drizzle over more dressing and finally sprinkle with the coriander.